In the 1960's, Joe Hollyfield chose as his dissertation research a study of the origins and replacement of red blood cells in the frog, Rana pipiens. This part of the work was published as: The Origin of Erythroblasts in Rana pipiens Tadpoles. Joe G. Hollyfield (1966) Developmental Biology 14:461-480. The earliest red blood cells are formed in the blood island. Later, in succession, the kidneys (pronephros and mesonephros) begin to form blood cells, then by metamorphosis, the long bones and spleen form red blood cells. The adult relies mainly on the spleen for its supply of red blood cells. Erythrocytes (red blood cells) could arise from the mesenchyme of each of the sites, or erythroblasts from the blood island could colonize each site. Hemoglobin changes as the sites of formation change. Do the different hemoglobins arise from different cell lines, or from a common progenitor? Hollyfield began by focusing on the origin of erythrocytes of the kidneys. To establish where the erythroblasts of the sites came from, it was necessary to transplant tissues that will form the sites from one embryo to another. To recognize cells from the donor tissues from those of the host, Hollyfield used embryos of different ploidies. He created triploid embryos by temperature shocking freshly laid fertilized eggs. He could then discern the difference in size between blood cells from a triploid from those of a normal diploid animal. Ploidy was determined by counting the nucleoli in epidermal nuclei. Because blood cell size may vary at different stages of development, it was necessary to establish the size ranges of blood cells at each stage of development in diploid animals, and in triploid animals. 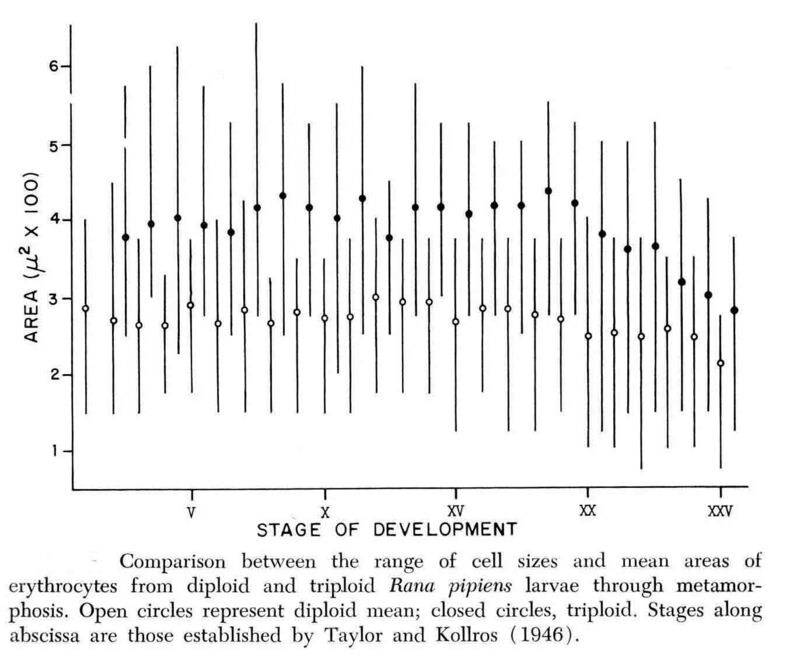 The graph below shows the ranges of sizes of red blood cells in diploid and triploid embryos during development of the tadpole. There is some overlap in size range between the two ploidies, but measurements of large numbers of blood cells made it possible to discern the triploids from the diploids. Blood was taken for examination from tadpole stages VIII to XV. Tadpoles earlier than stage VIII were too small to get reliable blood samples. It was known that immune responses appear in this animal at stage XVI so no blood samples were taken after stage XV. The size frequency of blood cells between stages VIII and XV are illustrated below. The results of these transplantation experiments give the conclusion that stem cells in later blood-forming sites arise within the sites and are not derived from the earlier blood island. Hollyfield extended his study to red blood cell replacement at metamorphosis. This work was published as: Erythrocyte Replacement at Metamorphosis in the Frog, Rana pipiens. Joe G. Hollyfield (1966). Journal of Morphology 119:1-6. Hollyfield states "It is well known that the hemoglobins of adult and tadpole anurans are different. It is also known that both tadpole and adult hemoglobins are present in animals during the terminal period of larval life. It is the purpose of this paper to describe cell line changes that correlate with existing knowledge of hemoglobin changes at metamorphosis." Near metamorphosis, hemoglobins of both the tadpole and the adult are present. Hollyfield found a correlating change in appearance of the blood cells (see below). When treated with thyroxin at younger stages, the small crenulated cells appeared prematurely at earlier stages. These cell differences correlate with appearance of adult hemoglobin at earlier stages when the tadpole was treated with thyroxin.